Something tells me that there's not going to be many, if any, but let's see. MaxGravy and Splunky are vegan. They eat awesome food dishes. I am far from a strict vegetarian, however, 80% of my meals are non-meat (ironic, as I just passed up a veggie option in favor of a tri tip rice bowl). Blue Angel wrote: MaxGravy and Splunky are vegan. They eat awesome food dishes. Actually, I believe they are a variety of vegetarian as I know they love their catfish and sushi. Lets see what they claim to be. We're mostly vegan. We do enjoy sushi and catfish as feast foods occasionally, but our home kitchen is vegan. Splunky is an amazing cook! fredzoyt wrote: I eat vegetables. I suppose at least 50% of our food is vegy's. Over the years I have shifted mostly to veg and away from meat but just can't take it all out of my diet. The Pleasure Trap: You know what you should do, so why is it so hard to do it? The Pleasure Trap is also a book by Dr. Douglas Lisle. Splunky and I have had the pleasure of meeting Dr. Lisle and have heard him speak several times. High calorie dense foods are drugs and many Americans are addicted. It's not your fault though. We've been manipulated and marketed to since we were kids. In the natural world our instincts helped us survive, but in today's artificial world we're killing ourselves with over processed foods that our bodies were never intended to eat. The Pleasure Trap is the elusive force that is actually your own nervous system’s “internal compass,” telling you what is best for you, in a world where it doesn’t serve you the way it was designed to. As you may have guessed by now, one of the most destructive aspects of The Pleasure Trap is food. The Standard American Diet, and the marketing efforts and food science supporting it, have rendered most of us addicts—and rendered most of us sick with migraines, IBS, Interstitial Cystitis, arthritis, and other manifestations of inflammation, as well as major diseases like diabetes, cancer, and heart disease. Illnesses and disease—which we medicate with pain-avoidance drugs, which make us crave processed foods, and make us rock and roll that hamster wheel. My wife hasn't had meat or eggs of any kind in 25+ years. I'm ~75% there. Working on it. Dr. Fuhrman and Dr. Colin Campbell have great info about it. For ~4 months I was working the Fuhrman (lifestyle) diet really well.... Then back to the old habits. Anyway, Why do you ask? scottcped wrote: My wife hasn't had meat or eggs of any kind in 25+ years. I'm ~75% there. Working on it. Dr. Fuhrman and Dr. Colin Campbell have great info about it. For ~4 months I was working the Fuhrman (lifestyle) diet really well.... Then back to the old habits. Anyway, Why do you ask? I like Dr. Fuhrman's message but I find him to be more a salesman than someone like Dr. John McDougall who puts all of his information and recipes on the web for free. We've met T. Colin Campbell and have an autographed copy of the China Syndrome. That man is a genius. I agree with you on Fuhrman, I've had that feeling in my gut. Thanks for letting me know about Dr. John McDougall. I'll sick the wifey on that info. Was it Forks over knives with T. Colin Campbell? (I remember his name so readily, b/c that is my son's name... well, minus the T). I liked the Forks video, with the exception of the extreme left bias. How'd ya meet him? Book signing? Splunky and I have been patients of John McDougall for many years. We've been through several of his programs, including the 12-day live-in program. We also did a 10-day fast at True North Health. Along the way we've many proponents of the vegan diet, including Dr. Campbell & Dr. Lisle. I only eat meat that I know where it comes from. And I steer clear of filter feeding seafood. My girlfriend is a pescetarian so I don't eat nearly as much meat as I used to. I have cut out all pork, except for bacon of course. I try to keep my sugar in check and try not to have any hydrogenated anything! Why do you ask? Thinking about switching? self professed carnitarian. 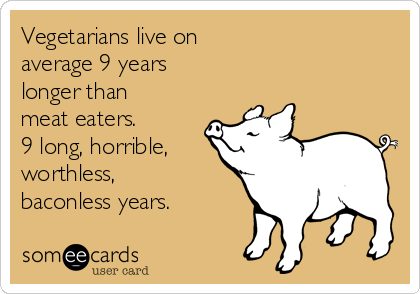 I hate veggies. What I'm looking for right now is any first-hand opinions from those who have tried one or more of the many frozen grocery-store options, from brands such as Morningstar Farms, LightLife, and others in the Veggie/Vegan marketplace. Amy's Burritos. They make several that are vegan. They do have added oil but still healthier than most frozen meals. Very easy to cook in the microwave.